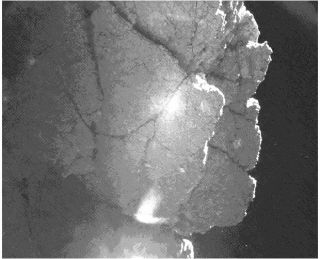 After bouncing, the European Space Agency's Philae lander obtained this view of a cliff on the nucleus of comet 67P/Churyumov-Gerasimenko. SAN FRANCISCO — Europe's Philae comet lander may be about to wake up from its lengthy, unplanned slumber. Philae, part of the European Space Agency's Rosetta mission, went into hibernation in mid-November, a few days after executing a dramatic and historic touchdown on the surface of Comet 67P/Churyumov-Gerasimenko — the first-ever soft landing on one of these icy relics from the solar system's formation. But it's now approaching summer in Philae's presumed location, so the washing-machine-size lander could soon access enough energy to open its eyes and start working again, mission scientists said. "Pessimistically, it will be after Easter; [optimistically], it will be much prior to that," Philae lead scientist Jean-Pierre Bibring said during a news conference today (Dec. 17) here at the annual fall meeting of the American Geophysical Union. "It all depends on how the sun will go over the horizon, the local horizon." The uncertainty stems, in large part, from the fact that the mission team still doesn't know exactly where Philae landed on the comet. Researchers have performed several search campaigns using cameras aboard the Rosetta mothership, which remains in orbit around Comet 67P/C-G, but so far, they haven't been able to pinpoint the lander. However, images from the most recent campaign, which extended from Dec. 12 through Dec. 14, are still coming down to Earth, and mission scientists expressed optimism that at least one of them would show Philae's location. Philae should survive the frigid conditions on the comet's surface and be ready to go when the time comes, Bibring said, adding that the lander and its 10 science instruments were designed to operate in the cold. "I think we managed to make a very robust system," he said. "My suspicion is that we will be in good shape." "The material that we have ahead of us is certainly fantastic," Bibring told Space.com. "We see the building blocks we are desperately looking for — icy material loaded with organics." Meanwhile, exciting things are afoot for the Rosetta mothership, which continues to study Comet 67P/C-G from orbit. Rosetta will fly within 4 miles (6 km) of the comet's surface in February, returning imagery with a resolution of just a few inches per pixel, researchers said. And in July or thereabouts, the mission team will attempt to fly Rosetta through a "jet" of material outgassing from 67P's surface, said Rosetta project scientist Matt Taylor. Rosetta launched in 2004 and arrived in orbit around Comet 67P/C-G in August of this year. The mission aims to learn more about composition of comets, as well as their structure, thereby revealing insights about the conditions prevalent during the solar system's early days. The Rosetta mission is currently scheduled to operate until December 2015, but team members are looking at possibly extending the mission into 2016 to keep studying 67P. Taylor said he and other team members would like to land Rosetta on the comet when the probe's end is near, rather than simply letting its fuel run out in orbit. "It appears to be more compelling to do this spiraling in," Taylor told Space.com. "So we'll probably have a fourth landing."